I have decided to make a concerted effort to improve the quality of the subject matter on my blog this time round. You see, I've just read the search terms on Google Analytics and found people looking for 'woman with bag over her head" had landed on my blog not once but 17 times in one week. Personally, I don't want to be known as some kind of senior Miley Cyrus of the blogging world. So, this post is going to be more cultural and topical. And definitely age appropriate. So what could be more cultural and topical than sport? And the Winter Olympics in particular. Well it might be except for the fact that I don't think I've watched the Winter Olympics since Torvill and Dean got perfect scores in their Bolero routine 30 years ago. However, in a serious quest to find some recent Olympic news I did uncover something interesting and age appropriate. I would have assumed that at 55 and 54 respectively, they would have been lounging poolside somewhere enjoying their retirement and living off the riches of their long career. After all, they are still the only ones to ever receive a perfect score in Olympic skating history. Relax? Of course not. Crazy, crazy idea. Elite sportspeople do not think like you or I (excluding you Peggy as I know you've been cycling every day lately..well a week is ok) no matter what the numbers say on their birth certificate. Torvill and Dean have apparently just returned to Sarajevo to recreate their winning Bolero performance. Not just in pictures people but actually on the ice. Now given most of us can remember 30 years ago, I want you to watch this and imagine.....being dragged around an ice rink and not just out of bed. It is amazing. And no, I am not going to search for the original performance as I would like to think that in 30 years it has only got better. Just like us. Now watch it and weep...for many different reasons .....like could I even bend down that far to put skates on?? This next video is really for my mother but anyone else can look too if you're not in a hurry to put your skates on. I was trying to explain to Mum that my house had been decorated by a warped exhibitionist called Kermit. It was all lost in translation so I thought I would show her my bedroom to explain it. Now when watching the video Mum I know the bed covers are not straight. You see after watching Torvill and Dean I had to have a bit of a lie down to recover and forgot to straighten them up. Also, I have yet to get bedroom curtains, the ones that were there had to be removed quickly, for the sake of my mental health. In particular, please note how the ensuite and WIR has its own deck with sliding glass doors (new blinds there now). So, why Kermit the exhibitionist? 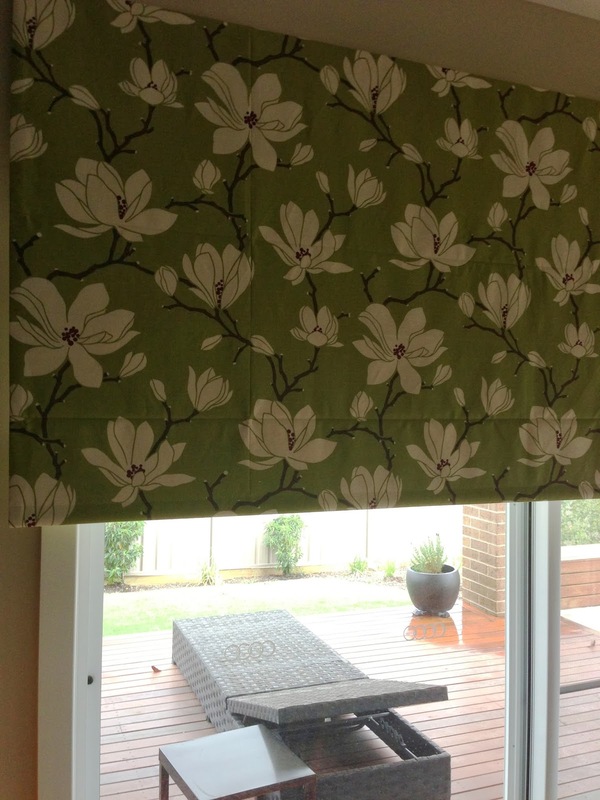 Because on every window of nearly every room there are were these bright green loud, flowery roman blinds or curtains. Bizarrely, all the blinds only come half way down the window. Imagine that in the ensuite with dressing room close by and a glass sliding door to the little deck outside. One with nature comes to mind. Crazy!! Of course the blinds were pulled up when we looked at it and I assumed that they would be fine until we got round to replacing them.... I couldn't have had blinds that size 30 years ago let alone now. So now I have a house full of curtains up for grabs. Any midget exhibitionists can have the blinds free of charge, I am sure you know where to find me. Just google. The skating was amazing. To be so flexible at that age - just shows you that if you exercise every day, being limber is possible. Graceful, beautiful, strong, loved the Bolero music. It was all so tasteful and appropriate! Miley Cyrus, take note! You have created a serene haven in your bedroom and bath, Lilly! Love all the white, and your sense of scale and proportion, and how you arranged your things! Bravo!!! You have done a wonderful job decorating. I know, it is true what they say if you don't use it you lose it. Except I wouldn't have been doing that 30 years ago either. I have not finished the bedroom yet. The list is long. Big curtains and one day floorboards. I want to keep the colour scheme neutral so that I can add pops of other colour when I want. Blue, pink, green, purple. I do not want too much "stuff" around me ever. Just open and calming. The walk in robe and bathroom are beautiful but didnt feel it was appropriate to put them on video. Somehow I think decorating etc is never done as there is always something else to do. That was lovely. But I kept thinking at the beginning when they were kneeling on the ice that their knees must have been freezing! I bet they were. I think theyv'e retired now. I wonder do they get arthiritis or anything. Still amazing performance. I have been watching all he Slating.it is the only thing I am interested in. It all seems so very much more complicated and difficult now---I don't ever remember single skaters falling so much, EVER! Tovel & Dean were fabulous....That they can still do any of this 30 years later is a MIRACLE!! I LOVE how neat your Bedroom is. (Mine has never ever been this neat---not even from Day 1!!!) It's BEAUTIFUL and so very serene....! I cannot tell where the bed is messed up, by the way---it looks Neat As A Pin, to me! You should watch the Skating, if you get a chance---it is shocking how hard it is...! But very BEAUTIFUL! Yes serene it is. A little haven. Its not always as neat but its sparse and there is less to mess up. I dont want too much stuff around but I do want some Hollywood curtains. I did watch some skating at your suggestion and it is amazing. Beautiful. your place looks amazing! And what chemistry those 2 will always have. I know Christine I always thought they were a couple but apparently not. What a great partnership they have had. I'm throwing away my curtains too, getting some roller blinds. Don't like them but that's what the estate agent recommended. Had the carpets removed last month, wooden floors throughout. Yes YW and that is how its going to remain lol. Floorboards are beautiful but even though I wanted them they are not in this house. One day maybe. You must be having fun doing up your house. Blinds are popular and a safer option. Unless curtains are plain they can really turn buyers away. Good luck with it all. The Tovel & Dean video was beautiful. I haven't watched much of the Olympics but I have watched the ice skating. The ice dancing competition was wonderful. What a lovely serene space you've created. Very pretty. Thanks Cheryl its definitely a girly bedroom. Seems like the ice skating is everyone's favourite. It is lovely to watch. Ha blinds for the blind. Did you just pick up any type of background music for your clip? Background music like all music is certainly individual taste. Your selection of music just places me into a murder mystery movie. That's OK with me but some people (your mom?) might get a little freaked out. Of course, others might listen and hear a beautiful sunny morning breaking through those half blinds. Ha ha Bill I did not notice the music because when I uploaded the video i only had music playing in the background like I always do. Maybe it was a breach of copyright? It does sound rather dramatic as though someone will jump out of a cupboard holding a knife. Yes there has been a lot of sunshine here. And very hot. Who says global warming does not exist? My eyes began to turn red. Made me sad to think it was from Fred. Now that you have read this much browse up and over to the whole post. I love how you decorated your room. We don't have curtains in our home. My husband says they are dust magnets :) I hope my grandmother never hears that, because she used to make curtains for a living years and years ago. I love the ice skating, but that's the only aspect of the winter games that I enjoy. I agree with Greg but I am going to put heavy ones in the bedroom at some point because i need them to block out light and a bit of noise. Plus I will keep the blinds. Oh I wish your grandmother was here then as the ones you find nowadays look cheap and yuk. Yes, the ice skating is beautiful. Thank you for the tour. It all looks truly beautiful and very "Lilly". Love you. Oh my goodness gracious ... you are back and in fine form! Just like Torvill and Dean!! Thirty years? They've sped by ~ kind of alarming how fast. I love your sense of humour .. keep the posts coming. Oh wow! Your room looks gorgeous! As for the incredible Torvill and Dean, I can't even walk like I used to 30 years ago. Sheesh! I think you and Art are a shining example to the rest of us Kay. Seriously.